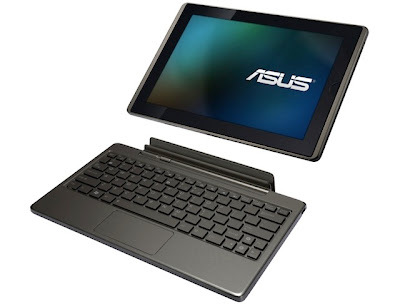 The ASUS Eee Pad Transformer at first sight will make you wonder if it is a tablet or a netbook. Seriously, is it a tablet or a netbook? What exactly is the ASUS Eee Pad Transformer to begin with? That folks, is kind of hard to answer. With the ASUS Eee Pad, you can type on a full keyboard making you forget that you are using a Honeycomb tablet - with a keyboard and a trackpad -just like a netbook or a laptop with Honeycomb. So, what is it really? The Transformer is ASUS’ 10.1-inch tablet (there you go, it’s a tablet after all) with Android 3.0.1, which happens to be the latest released version of Google's Honeycomb. Under the hood, it’s got a dual-core NVIDIA Tegra 2 processor running at 1GHz to power its operation. But why is it called Transfomer? No sir, it doesn’t transform into a robot as you might have expected. It gets its name from the optional keyboard dock which may I remind you is neither a Bluetooth keyboard nor a fancy tethering system. It is a full-fledged, albeit undersized laptop-style keyboard, with a hinge, that transforms this Android tablet to so much more, hence the moniker “Transformer”. The back of the Transformer has a nice, textured pattern and its coppery color almost makes you think of it as faux-leather. It is kind of elegant, if I may say. Don’t be disappointed by the fact that it’s made of cold, hard plastic though. That is sort of negligible at this point. At 10.6 inches, it’s a bit taller compared to the Motorola Xoom but both tablets measure a half inch in thickness. The transformer is a bit wider though at 6.9 inches but makes up for heft where it weighs 1.49 pounds compared to Xoom’s 1.6 pounds. With the weight difference, you don’t get the urge to put it down as often as you do with the Xoom. The Transformer is powered by a dual-core NVIDIA Tegra 2 1GHz processor with 1GB of RAM. For storage purposes, you can select between the 16GB or 32GB version, both expandable via a mciroSD card slot. Its dual-core processor is blazing fast resulting to very smooth transition animations when switching between homepages. This trickles down to web browsing as well where transitions from portrait to landscape and vice versa are very quick. The Transformer comes with a 10.1-inch IPS (in-plane switching) display with a 1280 x 800 resolution and a screen density of 160 pixels per inch. The characteristics of the display are kind of similar to the iPad hence, maximum brightness, black level along with contrast are nearly identical to it. Although the Transformer’s screen looks absolutely fantastic and viewing angles are superb, the glare seems to be a letdown and rendering it pretty much unusable outdoors. The scratch-resistant Gorilla glass and wider aspect ratio makes up for that though as it leaves more room for web pages and other content. Who would want to use a tablet, or any gadget for that matter, in the blistering heat brought about by the summer in the first place? Though the Transformer is a Wi-Fi only device, it’s got 802.11 b/g/n covered. Bluetooth 2.1 + EDR is also standard along with GPS for navigation and location-based services. The Transformer runs Android 3.0.1 Honeycomb, Google’s tablet version of Android and comes largely unskinned but bottoms in the System Bar-back, home, and multitasking-are customized to have a much softer feel compared to the buttons in the stock Honeycomb. It starts out with a wide landscape with the five home screens with the center screen having an AccuWeather-powered weather widget with nice little graphics for the day’s forecast. A user-removable date widget can also be found at the bottom right of every home screen. The standard Google apps such as YouTube, Google Books, Android Market, Gmail and the like are also included. Not to be left out, ASUS also preinstalled some of their own apps like the @Vibe Internet music player. With Pandora on board along with other music apps such as Amazon MP3, it’s just a matter of time before these ASUS apps are forgotten. ASUS also has its own bookstore and reader under the “My Library” app but with Amazon Kindle and Google Books already on board, these will meet the same fate as @Vibe Internet. The Polaris Office documents app is preinstalled as well that lets you create spreadsheets and PowerPoint-like presentations along with decent word-processing capabilities. The Transformer is also DLNA-enabled, letting you share pictures, music and video wirelessly with other DLNA-enabled devices. Though, not as widespread as we would want them to be, it would definitely be better to have it and not need it that need it and not have it, isn’t it? The Transformer sports a 5-megapixel shooter at the back and a 1.2-megapixel shooter facing you. Well, what can you expect about tablet cameras, right? They’re not going to rival your DSLR anytime soon. No flash for the rear camera either, but like I said, you’re not going to run around lugging this thing as if it’s a 10.1-inch point-and-shoot right? The front-facing camera is at least useable for video chats with Gtalk, so it has something going on for it. Although the keyboard is billed as a mobile dock in the packaging, allow me to refer to it as a transformative experience, both literally and figuratively. Once you dock the tablet onto the keyboard dock, you go from tablet to Honeycomb laptop. It’s not a tablet with a keyboard dock my dear, but a Honeycomb laptop. Sorry, no sound effects there to go along with the transformation. The keyboard is as wide as the tablet and slides into the hinge and locks into place. Once it’s there, the tablet and the keyboard become a single solid piece of hardware. Think Voltron albeit with just two lions and not five - something like that. The keyboard dock not only features a keyboard but a trackpad with mouse buttons as well. Mouse buttons are in a single bar but no problems were encountered in differentiation a left-click from a right-click. Don’t be confused though as this is an Android platform we are working with and not your typical Windows environment. The right-click serves as a back button and you are not to expect contextual menus to come out. The keyboard is pretty good with chicklet-style keys and a full number row along with arrow keys and Android’s usual home-menu-back-search keys located strategically around it for easy access. It may not be a full-sized keyboard but once you get the hang of it, it is pretty usable. No complaints here, you see? With the tablet firmly in place on the keyboard dock for the whole Transformers experience, this is what everything comes down to. Gone are the days where you work a little on the keyboard then reach up to touch the screen. No more type, reach, type, reach sort of movements. As soon as the tablet gets connected to the keyboard dock, it ceases to be a tablet and automatically kicks in to laptop mode. Browsing is pretty much as expected with the stock Android browser and though Adobe Flash 10.2 is at your disposal, it is still far from a full Chrome or Firefox experience on a regular laptop. Email is a given with you getting an Outlooky feel to all things email with the redesign of Gmail in Honeycomb. The usual complement of apps on the other hand translated very well to the keyboard and mouse experience but touchscreen-based games have found the Transformer a little wanting. You need to undock for these games since accelerometers and attached keyboards just don’t mix very well. The Transformer has a 24.4wh lithium-polymer battery and lasts approximately 9.5 hours on a single charge. The keyboard dock also has a battery tucked into it and once transformed, ramps up the battery life of the whole Android laptop to a staggering approximate of 16 hours. However, different strokes for different folks come into play here especially with regard to usage so battery life will definitely vary. As a Honeycomb tablet, the ASUS Eee Pad Transformer is as good as it gets. Forget about how it lags behind other tablets in terms of design and construction with its plastic build, but add on the keyboard dock and no other Android tablet comes close to it. Will the Transformer replace a traditional Windows or Macintosh laptop computer? -Definitely not just yet. For its price with the dock included, you can get a more powerful laptop with better features. But, forget about that for a moment. Think about getting a semi-laptop experience with the might of Android 3.0 Honeycomb in the ASUS Eee Pad Transformer. You get an Android tablet plus an Android laptop. And that’s something nobody but ASUS can yet offer. End of story. I really need to write shorter comments and lose some weight, because I was somewhere halfway through a 500 words long one when my belly clicked on the trackpad of my MB Pro. F-bomb! Anyway, I was on about how glossy is not a glitch anymore but the thing to expect. It's like their way of saying they're not interested in outdoor use, because their main concerns are good contrast, protected surface and it's a part of the capacitive layer they're not going to work around. All in all, it's a really nice tablet, but I'm concerned about the price. It goes for £380 without the keyboard dock, £430 with one. About the price of the second generation of iVoldemort. Is it going to be enough for aspiring iPad customers to steer their way and go Asus instead? Maybe. But maybe is unfortunately not always a yes on the fierce market of tablets. Awesome product, good idea, but it will have to be shoved between iPads and netbooks with a force. Not an easy task to cater to two, so distinguished groups; the 'just the bare minimum' netbook customer and the 'can you make it fly and dispense free beer?' tablet customer. We'll see. apple fanboy. you are idiot.